Raymonde Mamane becomes first Jewish fatality from massive terror attack in southern French city. 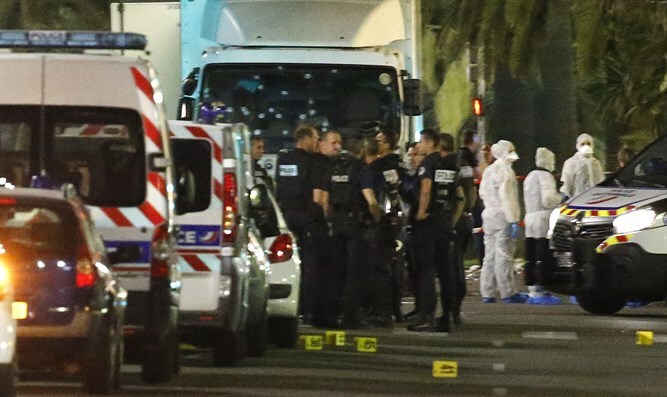 A 77-year woman who spent Bastille Day last Thursday in the city of Nice with her sister died on Monday, becoming the first Jewish fatality from the massive terror attack that ravaged the southern French town. Her death brings the total death count to 85, excluding the terrorist, who was shot dead by police in the midst of his attack. Raymonde Mamane, who along with her sister Clara Ben-Shimon, 75, was severely wounded by Tunisian-born terrorist Mohamed Lahouaiej Bouhlel, succumbed to her injuries on Monday, and passed away in local hospital. The two were listed in critical condition since Friday, and were both placed on respirators. Friends of the family described Mamane as “a wonderful woman who was [totally] dedicated to her family”, Kikar HaShabbat reported. Mamane’s sister, Ben-Shimon, remains unconscious and in critical condition. Both of her legs have been amputated. Relatives called on the public to pray on behalf of Carla Chaya Bat Nona (Ben-Shimon).